Located in the city of Brantford, and just west of the Grand River, the West Brant community has a small-town feel that residents cherish. Enjoy a variety of both outdoor and indoor activities in the West Brant area, such as the Veterans Memorial Parkway trail that runs through the neighbourhood, swerving through lush foliage and wide open fields. Runners, bicyclists, and outdoor enthusiasts love the solidarity, peace, and quiet of their morning runs through the tall forest trees. West Brant is surrounded by Rotary Park, Hillcrest Park, and Lion’s park, as residents enjoy the many amenities and facilities to their use, including basketball courts, tennis courts, soccer fields, and playgrounds. 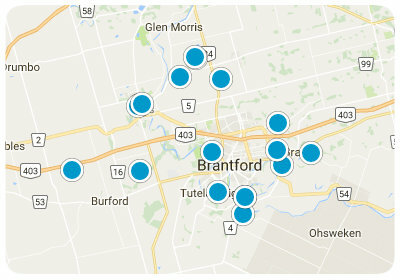 One of the most desirable things about living in West Brant is its close proximity to downtown Brantford. You can enjoy a night on the town, shopping, dining, and entertainment, including ice skating at Harmony Square, playing games at the Brantford Sports Xcelerator Center, or attending a show at the Sanderson Performing Arts Center. Take a relaxing stroll on the D’Aubigny trail alongside the beautiful Grand River. Frequent travelers from West Brant will be delighted by the convenience of being 15 minutes away from the Brantford Municipal Airport, and close to Apps' Mill Nature Centre where you can enjoy exploring the many trails and creeks that run through it. Gorgeous homes are available in West Brant, including single-family houses and large estates that fill the community, many newly built or remodeled. These homes boast beautiful exteriors as well as interiors and include many convenient amenities including walkout basements, double car garages, spacious front patios, and master bedrooms that enjoy ensuite bathrooms and walk-in closets. Homes in the West Brant area are around the 2,000 to 4,000 square foot range, and the properties have lot sizes that are perfect for families and friends to gather in. All in all, West Brant is a wonderfully well-rounded community that will fit the criteria of any homebuyer’s taste and budget. If you would like more information regarding homes for sale in West Brant, please allow us to assist you and contact us today.